Use it for focus. For a long time now, I’ve known that whenever I have significant editing or writing to do, the regular desktop is just the death of me — too many distractions. (At my old law firm I even tried to unplug the Internet cable so I had less distractions and, if memory serves, got a visit from tech support because they wondered what was wrong.) One of my old tricks has always been to write longhand, on paper. But: then you have all this text (largely illegible, if you’re me) to get into the computer, which requires time from either you or your assistant, both to enter and review. I had been gifted a keyboard forget the original reason why I had gotten a Bluetooth keyboard, but I had one laying around, so it occurred to me: why not try the iPad and keyboard? I now think of it as my little typewriter for 2015 — I never switch between screens the way I do on my desktop. Use it for travel. The Bluetooth keyboard is super lightweight and fits in most of my bags. It’s easily turned off and on (simple switch on the bottom) so you don’t have to worry about running the batteries down or anything when you chuck it in your bag. I’ve even started using it with my iPhone if I’m flying or taking a train because it fits on the little tray table better. Grab and go. It’s so lightweight that I even grab it if I expect I might have to wait a while somewhere, like the doctor’s office. No cords, no need for wifi (unless you’re using it for email, but even then I usually just work off previously downloaded emails and then sync when I’m back in a wifi zone), and it’s so lightweight you don’t feel like you’ve sacrificed anything if you didn’t actually get around to using it. The only cons of note that I see: 1) It sometimes takes a few tries to get it connected via Bluetooth, which is annoying. 2) If you use a ton of keyboard shortcuts involving keys like Ctrl, Del, etc, this particular keyboard is laid out differently than my desktop keyboard, so things like function keys are in different spots. 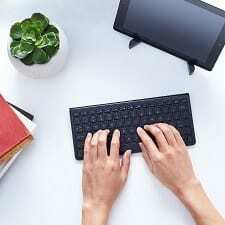 3) Yes, it is a smaller keyboard — I haven’t felt too cramped on it at all, but then I have fairly small hands. Ladies, do you have a tool, device, or app that you aboslutely LOVE? Share it with us in the comments. Want more thoughts on essential tools for bloggers? Sign up for Kat’s email list here. I have a Surface and love it. 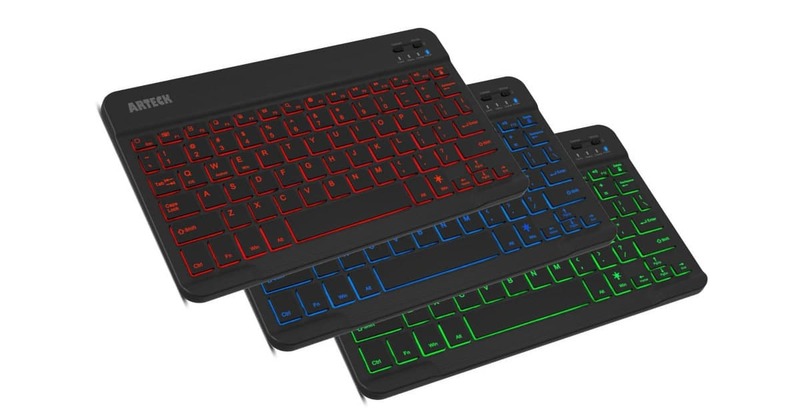 Do you use the snap-in keyboard that comes with it, or do you use a separate keyboard? I know we’ve discussed this to dealth but I’m still trying to figure out what to do for Halloween. I’m not in a legal/finance environment. I’m in IT, and Halloween is kind of a big deal for my company. But I refuse to A. spend a ton of money, B. be uncomfortable. Thinking witch, not really feeling it but I’m also not really feeling like remotely going all out. The office is strongly suggesting a theme based on a contract we just signed, and I’m completely not feeling that, both the specific theme and the “strong suggestion” . Can you borrow nurse’s scrubs or doctor scrubs from a friend? How about a tennis outfit with an old tennis racket? Can you wear lots of college team items – sweatshirt, pants, hat? Harry Potter/Hermoine Granger with an old black graduation gown you might have lying around? Steve Jobs (black t-shirt, black jeans) or Mark Zuckerberg (hoodie and jeans) or Sheryl Sandberg (?not sure) with a sign or nametag? Princess Leia. IT-appropriate and you can get by with just the hair, wearing normal clothing. I *ADORE* my Samsung Series 9 laptop. It is a few years old now and weighs about the same as my iPad2 (w/ protective case on). It is lightweight, sharp screen and a full computer – I bring it everywhere! I used to work on Wall Street so wanted a PC as Apple & Excel don’t get along well. I love my wireless mouse – I don’t use a tablet for work stuff often (just candy crush saga and pinterest) but I love that I can use my wireless mouse for my home laptop or my work laptop when I work from home without the mess of the cord being in the way. It is also way easier to draw using a mouse than a trackpad. I also really like my JBL charge speaker. I like listening to music while I cook but don’t want to lug my laptop over. I have noticed some interference between the mouse and the speaker though when I use them near each other. I have a Bluetooth keyboard which is my email saviour on planes. I also love my Kindle. Apps…I really like AwardWallet for tracking multiple loyalty programs. Qantas app for tracking my upcoming trips. MyFitnessPal for attempting to hold myself accountable at the amazing breakfast buffets in Asia.